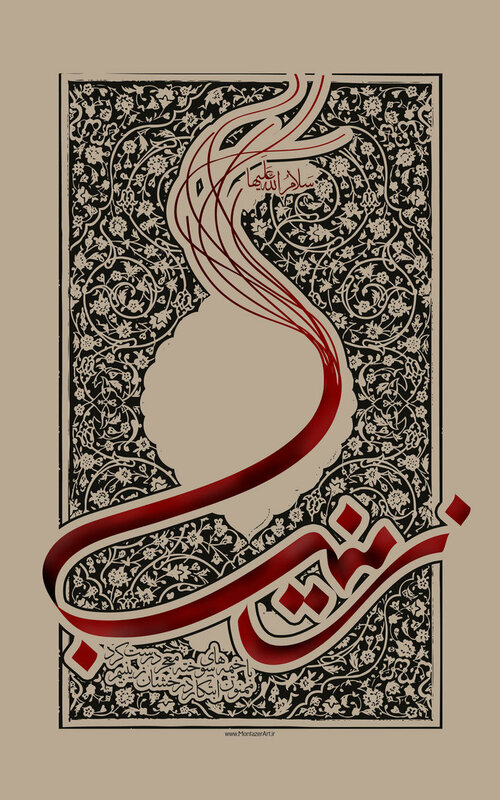 1400 years ago, Lady Zainab, grand daughter of the Holy Prophet, daughter of Ali ibn Abi Talib and Lady Fatima,and sister of Hasan and Hussein, the guardians of the youth of paradise, kept the revolution of Karbala alive. This great lady, a beacon of light not only for women but all of humanity, stood up against tyranny and injustice, and for the pursuit of truth, an untainted way of life that was being corrupted by power, greed and selfish interests. The fact that this revolution lives on in the hearts of many, like all of ours, is because we are naturally drawn to goodness, we are drawn to their sacrifices, fearlessness, God-consciousness and their representation of the unadulterated truth and morality. We are inspired by the courage of 72 men who were never intimidated by giants and powerful figures, despite having scores of thousands of men by their side. We are inspired by the daunting journey the ladies of Karbala braved after their men had been slaughtered, imprisoned and shackled with barely any food or water. We are inspired by that beautiful little child, who withered away in a prison as she cried for her father Hussain. We are inspired by Lady Zainab, as she rose with strength despite being hungry and thirsty for days, and spoke against the oppressor Yazid in his courtyard, unflinching, eloquent and with a lion-like zeal. We are inspired by her ability to preach the truth from home to home, keeping the spark of the revolution alive, the stories that she herself lived through and witnessed firsthand. We are her legacy. We weep for the martyrs of Karbala, we weep for the ladies and innocent children who faced such atrocity, and we stand in awe at the contributions made by Lady Zainab. We think about our problems and challenges we face daily and how they pale in comparison to what the family of Hussain faced. We think about ourselves, whether we would have had the courage to side with them on that day, or been like the people of Kufa, afraid of our own shadows. And most of all, we think about the families who face similar tragedies on a daily basis today. Let’s look around us, there are those who are homeless, those who are the victims of systemic racism, those who are starving in the lands of Yemen and Ethiopia, those who live under tyranny and occupation every day in Palestine, those who are fighting for clean drinking water against the Keystone Pipeline, those who are exploited for their minerals and sources in Afghanistan and elsewhere fueling mass poverty, those who are bullied every day in their schools and workplaces for practicing their faith and those who live under the terrorism and genocide our tax dollars are funding in Syria and elsewhere. These are only some of the issues that plague our work and global justice. Some of us are aloof to these issues because we enjoy living in oblivion, and others distance themselves because these issues are too depressing, not knowing that their silence condones and partakes in this very oppression. We see the elections and the media beating the drums of war, we see people, and even some Muslims aligning themselves with the corrupt because the righteous have less chances to emerge victorious. We let fear captivate us, catapult us into a world that can control us like cattle. Have we forgotten Lady Zainab, and all that she stood for? If Lady Zainab was here today, what would she do? What would she say? She would be ashamed of humanity losing themselves over what people think and feel and say to each other. What would she say about us being consumed by fear, even though our days in this world are numbered? What would she say about our obsession with materialism, and living in our bubbles and comforts while others are oppressed daily? Of us dreaming away and working exhaustively for a day when we die in peace, in our beds, reflecting on the good life we have lived. Is this all that we are meant to be and reduced to? To earn our livings, pay our bills, be with our families, and die? As Muslims and as citizens of the human race, we are meant to struggle in the path of God, so that He is pleased with us. Struggle by giving, struggle by helping the oppressed, and the voiceless, and the needy. Lady Zainab said, in her most trying time as the bodies of her brothers and nephews and children lay headless before her, “I see the beauty of God everywhere”. Do we see the beauty of God everywhere, in our actions, in our words, in people, in each other? Do we greet each other with nothing but goodness in our hearts? Do we work for peace daily as if it were our own flesh and blood hurting or dying or in need, or do we waste our days satiating a dream that ends with nice cars, a big house, money for our kids, and endless comforts? We post on social media about being lovers of peace, but where are our antiwar lobbyists? Where is the support for homegrown media efforts? Do we give charity like tourists so we can feel better that we gave, or do we put ourselves at personal risk for helping the poor and the oppressed, risks that entail that we leave our comfort zones and teach our children what really matters? Each of us here today has been born with a destiny, with great gifts that can never be replaced by anyone else. The dreams are there for us, but are we going to grab them by the horns? Are we going to be the living, breathing Karbala, with the love of justice and peace in our hearts? Many a time people ask, isn’t working for justice very idealistic, and does it even make a difference? Have we forgotten our Master, the one whom we leave our hope with and who will come with Jesus to reawaken a world of justice and peace, and help humanity prevail again? We must never lose hope, we must never despair, and we must strive every day. The choice is ours, we live in a great country that gives us the freedoms many others can never even dream of having. We have everything lined up for us so that we can stand up for the betterment and dignity of others and in turn the betterment of ourselves. It is now high time that we stop looking up to Lady Zainab as someone we can aspire to be in an unforeseen future, and actually start embodying every thing that she stood for, today. Zainab Merchant is a writer, children’s author and Editor-in-Chief at Zainab Rights, an online community that promotes Global Justice and Peace. She spends her days as a stay at home mom of three, her evenings as an International Security graduate student at Harvard University, and her nights editing and creating content for Zainab Rights. She believes passionately in a future that is devoid of oppression and falsehood, and strives to make that world possible every day.